Every once in a while, change is good. Even when blog templates seem reliable, it’s good to change it up. I was getting tired of my Prismacolor style template I’ve been using ever since my migration to my own hosted blog using WordPress. I haven’t made much significant changes to the side bars, which is good. My widgets are good the way they are and I have no desire to clutter it up with things such as links to Last.FM, a blogroll longer than the block where I live, flashy lights, etc. I tried some of the other minimalist templates a couple of weeks ago and none seem to fit at all. I’ve looked around a bit, and I find Vigilance serves my needs very well. Though a minimalist template, Vigilance doesn’t use Helvetica or make heavy use of sans-serif fonts. However, it makes use of the Georgia font, which I love. It’s very readable and attractive at the same time. Also, I used this typeface in creating my MFA thesis, so it has even added (sentimental) value. One thing definitely different from the previous template is that the header images rotate. I’ve cut some art images down to size (and some others) uploaded them and some photos to the header images folder, so it helps to keep things interesting. I’ve also added commentluv, which I’ve noticed on few of the blogs I regularly visit. So, if you leave a comment, it will link back to your blog’s latest post. As for the readers who are strictly Facebook users, it will not link back to your latest status or photo or whatever. 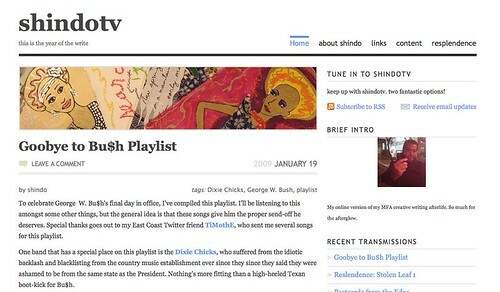 I have included an image of how the blog looked until I changed things. I still have the template in storage, so I could easily change it back if I want to. But, it’s much more fun to change it up. CommentLuv is definitely a great plugin asset to have on a blog.